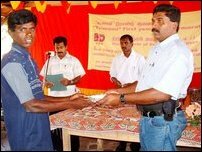 Thirty permanent houses constructed by the Tamil Rehabilitation Organization (TRO) with the financial assistance from the Operation-USA, an international non-government organization, were handed over to tsunami affected families in Kallady, at an event held Monday to mark the first year remembrance of tsunami disaster. 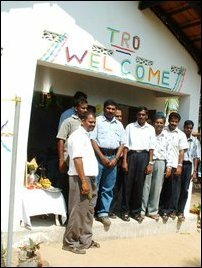 Kallady is a remote village in the Eachchilampathu division, down south of Trincomalee district. About 130 families live in Kallady. Fifty-two persons, including children and women died in tsunami waves in Kallady. Their houses were washed away by the tidal waves. Girl paying floral tribute to her brother died in tsunami on the first anniversary remembrance in Kallady village. Eachchilampathu AGA Mr.Umamaheswaran speaking while Mr.Kumaraguruparan of TRO and Mr.Elilan, LTTE’s Trincomalee district political head look on. Mr.Elilan hands over keys to a beneficiary (Mr.Vijekumar, TRO district Director and Mr.Kalaivarnan, TRO district project officer are seen in the middle). TRO officials and Mr.Elilan with beneficiaries in a newly constructed permanent house in Kallady. Following immediate relief, rehabilitation and livelihood assistance to the affected families, as the final phase, TRO with the financial support of Operation-USA started constructing 136 permanent houses. Construction works of thirty houses have been completed and work on about 110 is in progress, said Mr.V.Kalaivarnan, Project Officer of the TRO in Trincomalee district said at the event. Each house in 500 square feet with two rooms, a hall, and kitchen is constructed at a cost of about five hundred thousand rupees. Eachchilampathu Divisional Assistant Government Agent Mr.Umamaheswaran said in the Kallady GS unit alone 52 died in tsunami. In his division about one thousand houses were damaged, of these about 600 within the buffer zone. He commended the TRO for rendering immense services to the Eachchilampathu people during monsoon flood and tsunami. 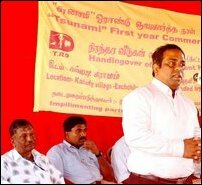 Mr.S.Elilan, LTTE Trincomalee district political head was the chief guest. Mr.Elilan said people should think of the future leaving the past suffering behind. All should with confidence come forward to build a new life for the future generation. Mr.P.Kandasamy, Secretary of the Trincomalee District Development Association (TDDA) and Mr.R.Thangarajah, Rural Development Society President also spoke. Mr.Elilan inaugurated the event of handing over the keys of permanent houses to thirty beneficiaries who were selected under the first phase. Thereafter Mr.Elilan declared open the first house by cutting the ribbon. Other guests followed it. Mr.S.Vijekumar, TRI Trincomalee District Director, Deputy Director Mr.S.Kumaraguruparan, and Mr.Ravi, TRO Muttur co-coordinator participated in the event. Rev.Fr.Easwaran blessed the event. At the commencement religious observances were held, remembering the dead in tsunami.